In the year of 1860, there was a lot of verbal and political activity about the matter of building roads across the Sierra Mountains. In April, 1860, the Tulare County Supervisors appointed a committee to view a road and pack trail from Visalia to Mono. On January 30, 1860, the Visalia Delta announced that a company had been formed and application was made to the legislature to build a toll road from Visalia to Owens Lake. S. G. George, H. L. Mathews. S. Sweet, Henry Bostwick, John Jordan, and W. F. Jordan. About or before that time, the large Coso Silver and Gold Mines opened up. They were located southeast of Owens Lake up in the Coso Range of mountains, east of Owens Valley. The mines are what attracted all of this excitement. whereas, the Board of Supervisors of Tulare County have this day passed a resolution instructing our Senator and Representative in the Legislature of the State of California, authorizing said County of Tulare to levy an additional road tax of 10 cents on each $100.00 worth of taxable property in said County. Now, therefore, if the Legislature shall pass the Act aforesaid, it is, by this Board ordered that all the taxes arising from the aforesaid special Act for one year, shall be applied to building and constructing a certain wagon road leading from San Luis Obispo County to Coso by the way of Visalia. Green Horn Mountain and the forks of the Kern River. To the Honorable Board of Supervisors of Tulare County. Your petitioners, residents of Tulare County, California would respectfully petition your Honorable Board to have made and declared open, a "Pack Trail" or passway leading from Tulare Valley across the mountains to the south end of Big Owen's Lake, said trail to commence or start from the County Road. at George E. Long's residence, passing through Yokohl Valley. and thence easterly across the mountains, to the said lake, and further petition your Honorable Board that the right of way and privilege of constructing the said trail be given and granted to John and William F. Jordan, the applicants and petitioners herein, and for which your petitioners will ever pray. Petition of John Jordan to build Toll Road. Filed November Ist, 1861. John Jordan having presented to this Board a petition from a number of the citizens of this County. praying that he be granted the right to construct a pack trail and wagon road leading from Tulare Valley across the mountains to the south end of Owen's Lake, said trail and road to commence in the County road at George E. Long's residence passing through Yokohl Valley, and thence easterly across said mountains to the said lake, and that he be permitted to charge toll on said trail and road. It is hereby ordered and ordained by this Board, that said John Jordan, his associates and assigns, be granted the exclusive right of way to locate said road and trail as desired, said right of way to be 33 feet wide, provided said Jordan, his heirs and associates and assigns, commence the construction of said trail within one year from the 1st day of January, 1861, and complete the same within two years from said date, and that they, the said Jordan, his associates and assigns, commence the construction of said wagon road within two years from said last day of January. A.D., 1861, and complete the same within five years from said date, and when said Jordan, his associates and assigns shall report a map of the survey of said trail, or road, the same being completely constructed and open and smooth for practical use, the road to be sixteen feet wide, this Board, or its successor, will fix such rate of toll as to them may seem fit, which said Jordan, his associates and assigns, shall charge and be at liberty to collect. This monument was dedicated by the Jordan Family on April 17, 1971 at the location where Yokohl Creek crosses Highway 198, five miles northeast of Exeter. 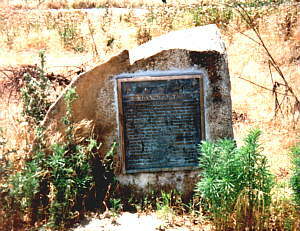 This site marks the beginning of the Jordan Trail that was started by John Jordan in 1861. Early in the month of May, 1861, John and W. F. Jordan started construction of their trail up over several mountains due east of what is now the town of Exeter. They left from the well known old Jordan homestead with ample loaded pack stock and saddle horses to do the job. 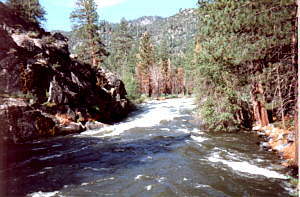 They went up the Yokohl Creek through the well known Yokohl Valley to the foot of Blue Ridge at the headwaters of Yokohl Creek, then south to the headwaters of Lewis Creek and then over the southern end of Blue Ridge almost directly west of the mouth of Bear Creek on the North Tule River. After descending Blue Ridge to the mouth of Bear Creek. they proceeded up the north ride of Bear Creek, holding up some higher above the creek at the point where E. W. Houghton built his cabin a year or so later. They crossed the creek there and stayed to the south of Bear Creek, then took a slight southeasterly direction to a point one and one-quarter miles south of what is now Balch Park and the dedicated Jordan redwood tree. From that point on, they proceeded down Meadow Creek in a more southernly rather than easternly direction to the middle fork of Tule River, then up the river a short distance to what is now Doyle Soda Springs or Camp Wishon. They crossed the river at this point, took a southeasternly direction up to Hassock Meadow, then headed east up to the south side of Jordan Peak and up over the summit at around 8.000 feet in elevation. 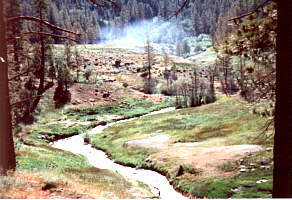 They continued in an easterly direction to Cabin Meadow or the headwaters of Clicks Creek, then through Logy Meadows to the point, down Fish Creek to Jerkey Meadows and on to Jug Spring and then northeasternly leading them to Little Kern River at what is now Horse Bridge where they crossed Little Kern. They traveled southeast to Trout Meadow, then they continued in a southeasternly direction to Big Kern River where they traveled up the river in a northeasternly direction to what is now Nine Mile Creek. Looking north at Trout Meadow from the Jordan Trail. These photos along the trail were taken by Larry Jordan, Great, Great Grandson of Captain John Jordan on a hike over the trail in July of 1995. 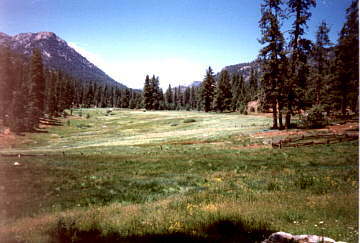 Entering large meadow from the west where Jordan Hot Springs is located. Smoke can be seen from morning camp fire. Nine Mile Creek runs out of bottom of picture. They proceeded up Nine Mile Creek in an easternly direction to Jordan Hot Springs, then southeasternly to Casa Viejo Meadows, then in a slight northeasternly direction to Monache Meadows. This part of the mountains between Casa Viejo Meadows to Olanche Pass is a high plateau of 8,800 feet, a stretch of ten miles of very easy traveling where they made good time. From Monache Meadows or Olanche Pass, which is 9,500 feet in elevation, they continued down the eastern side of the mountains following Walker Creek in a northeasternly direction to Olanche Station in Owens Valley at 3,600 feet--a 5,800 foot drop in elevation. Where they went from there is unknown. Along the Jordan Trail between Casa Vieja and Monache Meadows. 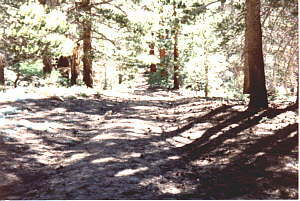 Here, the trail is wide enough for a wagon, wider than many other places along the trail. 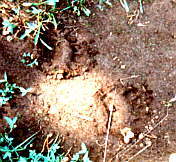 Many bear tracks were seen along the trail. Looking east into the Owens Valley from Olancha Pass. This route was Jordan's early route. in the same year or summer, he went back to Trout Meadows where he blazed a trail north to Kern River, then on up the river north passed Kern Lakes to Volcano Falls where Golden Trout Creek drops in, then up Golden Trout Creek in a northeasternly direction to Little Whitney Meadows crossing over Natural Bridge on their way. From Little Whitney Meadows, they traveled east to Groundhog Meadow, then headed northeast to Tunnel Meadow. Then they traveled north to Whitney Meadow and from Whitney Meadow east to Cotton Wood Pass--11,600 feet in elevation. From Cotton Wood Pass they traveled down to Cotton Wood Creek in an easternly direction to the west side of Great Owen Lake at 3,700 feet in elevation, or a drop of 7,000 feet. This, Jordan said, was his late summer route. When they went up Golden Trout Creek, or Volcano Creek as the old timers called it, they discussed the Golden Trout. This was the first time that white men had ever seen a golden trout. John Jordan and his party were the first white men ever to cross the Sierra Nevada Mountains in this region or route where Jordan blazed his trails. The trails he built were mostly easy going, except for some steep grades, as he followed the Indian trails or footpaths. The indians took the least resistant ways to places. There was no digging to be done on the very steep mountain sides although there was some underbrush to cut. The terrain was more open than it is now. His blazes were made on trees some distance apart. The blaze he used was eight inches wide and fourteen inches long on the near and far side of the blaze tree, cut through the bark to the solid part. The blaze was made with a pole axe. The Indians went from meadow to meadow as they went through the mountains. They originally followed the game trails. It took the Jordan's most of five months to push their trails across the mountains in this year. Early in May of 1862, Jordan told the editor of the Visalia Weekly Delta that his trail would be open to pack stock by June and to wagons, a short time thereafter. Soon, after early May of 1862, Jordan and his two sons, W. F. Jordan and S. T. Jordan, and two companions went over the mountains on the new lower trail. They did encounter some snow and they easily forded the rivers as they were low at that time of the year with the cold weather and all. The Jordan's finalized the eastern part of the trails with the County of Inyo. There is a record of this in the Inyo County Seat. On their way back across the mountains to notify the Tulare County Supervisors that their toll trail was ready for pack stock, they reached Big Kern River and it was a swift torrent and they could not ford it. The weather had warmed considerably, causing the snow to melt. Captain Jordan thought the weather would soon cool off and then he could ford the river. They decided to wait it out. In the meantime, his wife Eliza Jane grew inpatient as it was the agreement that her husband would return at a certain time. She sent a party in to find him. They found him and his party on the east side of Big Kern River at Kern Flats nearly starved as their food had run out and it was too early to hunt deer for food. The rescue party on the west side of the Kern River cooked food for the Jordan party and with slings they threw it across the river at the narrowest point. 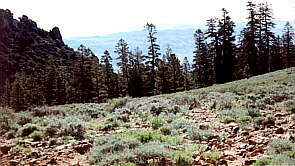 Looking into Kern Flat on an early morning in July 1995. This picture was taken from the west side of the canyon while standing near the Jordan Trail several thousand feet above the river. A telephoto lens was used here. This went on for a day or more until Captain Jordan grew inpatient. He decided to build a log raft so that they could cross the river. He wanted to get to Visalia to report to the supervisors. The five of them launched the raft and started across the river. About midway, the raft hit something and it broke to pieces. They had a long pole to help them move the raft so Jordan shouted to the other members to grab the pole. All of them succeeded in grabbing the pole except Captain Jordan and he was carried down the river by the current into a rough gorge and was never seen again. This was on May 22, 1862. 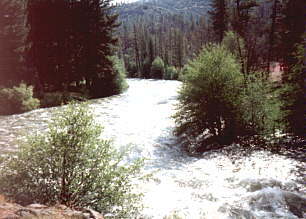 Kern River as seen from the present day bridge just north of Kern Flat. This was in July of '95 and though the water appears quite high, it is not nearly as high as it would be during early spring runoff in May. 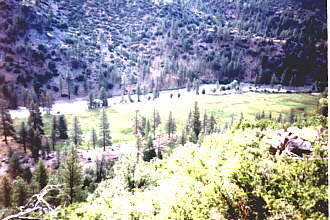 This photo is also taken from the Kern River Bridge at the upper end of Kern Flat. His sons decided not to carry on with the toll trail business and that is where it stands today. The Delta says the trip from Independence to Visalia via this trail took three days. The soldiers of the Union Army used it in 1863 in their move from Independence after the Indian trouble there and on the upper Kern River. In 1875, the Wheeler Expedition (Exploration and Surveys West of the 100th Meridian) traveled eastward on the Jordan Trail. The completion in 1864 of the toll road from the San Joaquin Valley to Owens Valley by way of Walker Pass apparently put an effective damper on the Trans-Sierra trail building activity across the Tule River country. This road was built by the McFarland Toll Road Company. William F. (Bill) Jordan writer and author of this data of building the Toll Trail through the Sierra Mountains. This material was compiled in April of 1976.